Tomorrow is Mother’s Day. And that’s reason enough to consider some connections between music, mothers, and their children. Moreover, parents and other adult caregivers are predisposed to interact with their infants by means of emotionally charged proto-musical vocalizations, or “motherese” (sometimes called baby talk, parentese, and so on). Motherese combines variations of pitch (melodic-type contours), timbre, rhythm, and accents that are the sonic building blocks of more sophisticated adult singing (such as lullabies). Because humans acquire the ability to distinguish changes in pitch and loudness in utero, it’s not surprising that infants learn to match some proto-musical elements after repeated parent-infant interactions. Caregivers use motherese to sooth, arouse, communicate, and play in caring and loving ways with their pre-linguistic infants. The musical-affective characteristics of adult-infant interactions establish and strengthen emotional bonds between caregivers and infants. Motherese also includes proto-musical play, and proto-musical play gives infants a way of engaging in and acquiring the foundations of social competence and confidence in a safe, risk-free, enjoyable, and participatory context that is fundamental to the development of their social cognition and “domain-general cultural competence.” If such emotional bonding or “primary intersubjectivity” fails to occur via early motherese and proto-musical interactions, infants may suffer. The values of motherese are clear. In a highly social species like ours, an infant’s chances of surviving depend on “fitness” beyond physical fitness, namely, “cultural fitness” and social-emotional fitness. These qualities follow from parent-infant bonding and primary intersubjectivity and anchor an individual’s ability to interact cooperatively with others and contribute to group cohesion. There are numerous projects around the world that support the above. For example, in a women’s prison near Oporto, Portugal, early childhood music specialists help incarcerated mothers learn lullabies they can sing to their infants to promote mother-infant bonding. The Lullaby Project pairs pregnant women and new mothers with professional artists to write and sing personal lullabies for their babies, supporting maternal health, aiding child development, and strengthening the bond between parent and child. In New York City, the project reaches mothers in hospitals, homeless shelters, schools, and at Rikers Island Correctional Facility. Extending across the country and through several international pilot programs, the Lullaby Project enables partner organizations to support families in their own communities. See Rhiannon Giddens performing one of the lullabies, “Mansell’s Waltz,” from the new album, released April 20, 2018 for Decca Records. Music, and therefore education in it, is crucial to human flourishing, or eudaimonia as the ancient Greeks called it. Music teaches us things about our common humanity that are worth knowing, and renders us less vulnerable to forces that subvert or compromise human well-being. Studying and making music changes who we are and what we expect from life. Do we know examples of music education that can lead to eudaimonia for every person? Yes. There are many. Here’s one. Meet music educator Adam Goldberg. Goldberg teaches at PS 177 in Queens, NY, a school that serves exceptional children. The mission of the school is based on its “new core standards” or CARE: Communicating, Applauding, Researching, and Educating. All these “standards” are, frankly, what good teaching-and-learning should do: harness the potential of the entire community to help students be their most complete selves, both now and for the future. Goldberg sees music making as a fundamental means for achieving this important lifelong goal. Through active music making, Goldberg’s students not only achieve musical understanding. They achieve a pathway to eudaimonia, and a shared engagement with/for others through music. In his recent book, Remixing the Classroom, Professor Randall Allsup offers a postmodern concept of school music education. Unfortunately, his book contains many falsehoods about the praxial philosophy of music education. 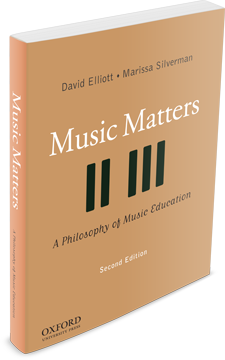 In our reply to Allsup, we analyze and refute his distortions of the praxial philosophy in Music Matters (2015). Published in Action, Criticism, and Theory for Music Education 16 (1): 124–67.